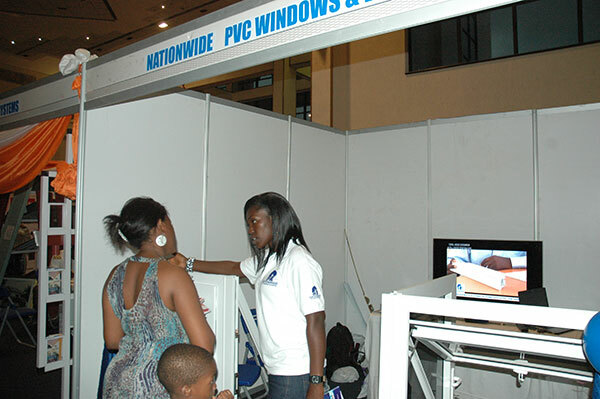 At Nationwide PVC Windows and Doors we provide quality European style Unplasticized Polyvinyl Chloride (uPVC) windows & doors and general building materials to home owners, real estate developers and building contractors. We supply uPVC profiles and accessories to other fabricators. We deliver to all ten regions of Ghana as well as Nigeria, Ivory Cost and Togo. These involve cutting down trees, lifelong maintenance, painting and the prospects of cracking, warping and rotting, leading to energy draining draughts. The average timber window doesn’t have the high tolerances necessary for double glazed windows. Aluminum consumes enormous energy in production. On top of this embodied energy, the metal is a natural conductor of heat - the opposite of effective insulation. As double glazing, ‘thermal breaks’ must be incorporated to reduce this heat transmission. improves security because the frames are re-enforced with steel all around and has multiple in-built locking system. seven years warranty for WINSA profiles and accessories. is quality, durable and turns out to be a more cost competitive option than metal. can last more than fifty years and that is due to its robust and chemically resistant nature. provides better insulation in the event of electrical fault or dangerous lightening strikes. can be made in different colours and laminates. enhances the architectural beauty and value of properties. has excellent seals which ensures that dust particles, insects, noise, and polluted air are kept to a minimum in a building. increases the efficiency of air-conditioners because of its excellent seals. is resistant to whether and has no maintenance requirements except cleaning with water. does not allow for those uncomfortable and ear piercing sounds made by metal windows when sliding and don’t come apart because they are joined by welding.